Info: This feature requires Elvis DAM version 4.6.10 or higher. In certain scenarios it can be advantageous to change this to another location. Example: When the Documents folder is stored on a server, accessing files from that location can be relatively slow. Step 1. 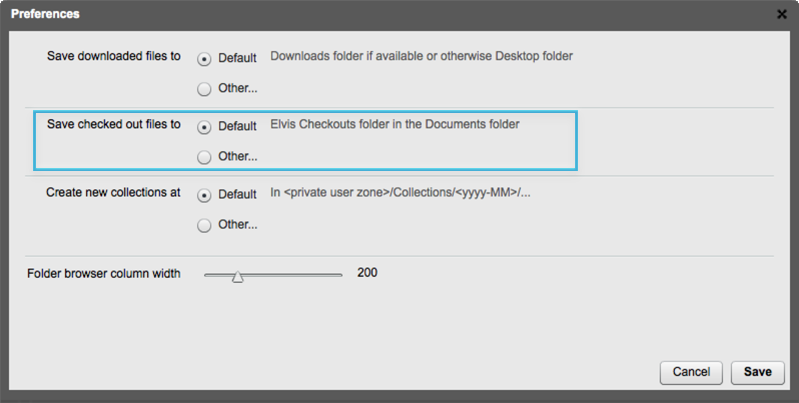 Access the Elvis DAM Preferences. Press Cmd+, (Mac OS X) or Ctr+, (Windows). Step 2. In the "Save checked out files to" section, click Other... and choose a folder where you want to store the checked-out files to (or create a new folder). If these conditions are not met, the Checkouts folder will remain in the current location. Figure: The "Save checked out files to" option in the Preferences. Step 3. Save your settings by clicking Save in the Preferences window.